Why don’t you spend Christmas Eve on December 24th internationally and have a pleasant holy night ? 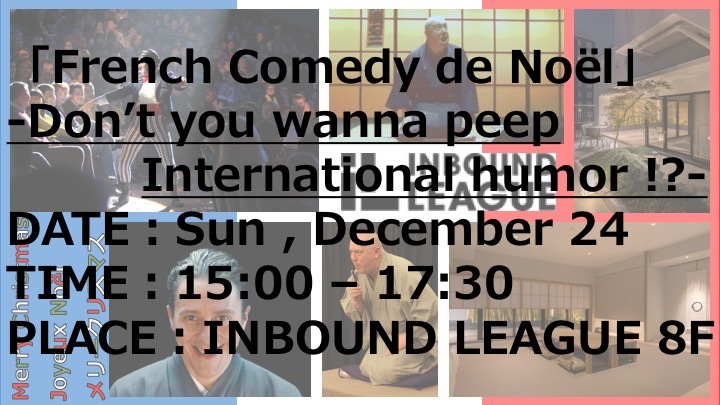 We will have a fun time at “INBOUND LEAGUE” opened in 20th October. Either by yourself, with your family or with your lover ! Please enjoy valuable time filled with global laughter in three languages ​​of Japanese · English · Français. ※ It can be enjoyed at half price of rakugo event of Shinjuku neighborhood! ※ Separate fee will be charged for the Party. 1973 Born in Lyon, artist and human love artist Stephen Ferrand. In 2009, He stayed in Kyoto with director Sandrine · Gabria for half a year and studied rakugo from Japanese rakugo. Sandrine · Gabria In 2010, they organized a dance called “Histoires tombées d’un éventail” and currently speak French Rakugo based on experience in Japan wearing kimonos in French-speaking countries It is showing off. Since 2011, he has appeared in “Japan Expo” (Paris · Marseille · Belgium) which is also talked about in Japan, holds a rakugo workshop at the Japanese Culture Center in Paris, and in March 2012 he will be present in Japan (Kyoto · Osaka · Nagoya · Tokyo · Sendai · Fukuoka) We are also hosting a tour, I came to Japan again from the end of March 2013 and also performed French Rakugo throughout the country. Director Sandrine Gabria who stayed in Kyoto for half a year is directing Stephen’s oral presentation. In 2014, she plans to host “Avignon Theater Festival’s vaudeville” in collaboration with the Japanese 噺 家 三 竜 亭 竜 楽 and Hayashiya Duta at the biggest theater festival in Europe “Avignon Theater Festival” (held in July). Full-edition Japanese rakugo performance by French people! Performing at a dinner show, an elderly home / welfare center, corporate events, etc. ~ Mercy my rakugo party (business trip) ~ I will go to see your smile! In 1973 he was born in Nice in Southern France and started to study Japanese in high school, visited Japan in September 1997 (Fukuoka), to the “Kyushu Japanese-French Studies Hall” Work. I went to Tokyo in 2001 and currently belongs to Anstitute Francais Japan in the French Embassy in Japan. In 2010, he met Rakugo and Hayashiya Kenta in Osaka and got to know Rakugo in full swing. He participated in “Rakugo International Convention in Chiba” held in 2011 and won third place. I accompany him in coordination and interpretation of the French performance of Sansutei Ryugaku who plays rakugo in foreign languages, and he is active in spreading rakugo overseas abroad. In July 2014, oral performances were held with Ryusuke and Mr. Kota at the world’s biggest theater festival “Avignon Festival”. In October 2015, “Rakugon society by French people” in Japan, December the same year realized the tour of Switzerland. From 2015, they will also demonstrate & lecture series “RAKUGO to the world” at the Meiji University Nakano Campus and the domestic NHK Cultural Center. In addition, he is in charge of the French version of comic book “Ikuruko Son” (Shogakkan) published on Rakugo. From 2016, regular appearance at Asakusa Toyokan.